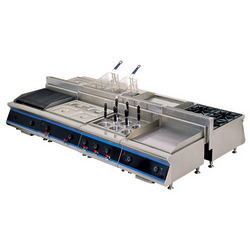 Our organization offers a superior range of Kitchen Equipment, which is widely used in various applications in hotels, canteens and restaurants. These products are made of stainless steel which have durability and corrosion resistance. We provide these equipment’s at cost effective rates at international standard. They can be easily used and maintained. These products are applicable in cooking different dishes with less effort and time. We check our products for safe and convenient usage. We offer a wide range of Kitchen which is of unique quality steel and available in various designs and sizes. We provide this island kitchen at affordable prices at international standard. Our products are designed with modern technology. We fabricate them as per the description of clients. They have long durability, comfortable and convenient in application. This product occupies less space and easy installed.